Well he's leaving some giant footsteps behind isn't he? Not always an easy person but Bob had a vision and plenty of passion. The recent years have not been kind but wow, what a life he's lead and what a legacy he's left behind. Lucky I got to meet him last year at Bathurst. Really awesome bloke. Will be missed dearly. Sad to see a true legend of the sport have such an inglorious end to his career. Also sad to see that he and Rodney never reconciled after the split and court case. 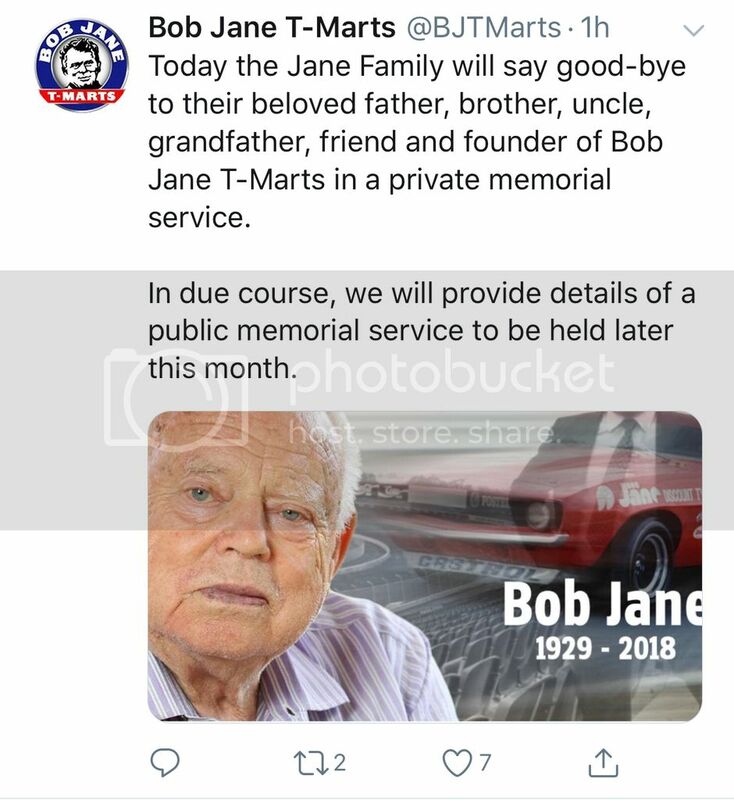 When I was a kid, I knew him to be the tyre dealer and was amazed at the racing legacy he had. Certainly a builder and a titan for a bulk of his life. An amazing contribution to Australian motorsport. I hope he is recognised and celebrated at the V8 1000 this weekend and at the Australian Grand Prix in March. R.I.P. Bob, a life lived at full throttle. Will Hagon made the comment on ABC news that, at its peak Bob Jane T-marts we’re selling a million tyres a year. What a contributor to motorsport on so many levels in Australia. The at track commentators mentioned it several times across the weekend, but there wasn’t a ceremony per se. Rev Coleman mentioned Mr Jane in his evocation. The two T-Mart Carreras had a nice touch. "In loving memory of Bob Jane" on the doors.